Only three ingredients! Just stir, cover, and refrigerate overnight. 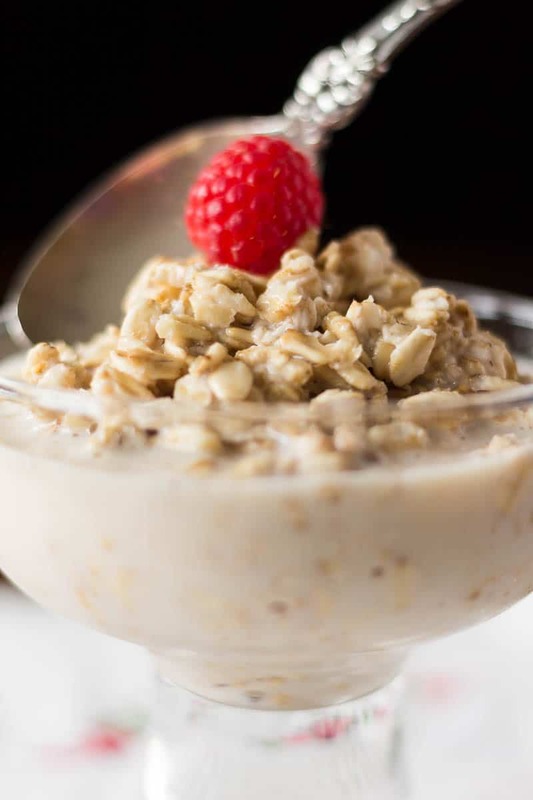 Using instant breakfast powder adds vitamins and minerals to these easy overnight oats. Ah, mornings. I’ll be the first to admit that I am not a morning person. My grandfather was a morning person, and my father is a morning person, but not me. Because of that fact, breakfast has always been something of an afterthought. I’m barely awake when I eat it, so why bother with anything creative? However, the same old, same old for breakfast every day does get a bit dull. How do you make breakfast interesting while still keeping it simple? My breakfast solution is Carnation Breakfast Essentials®. 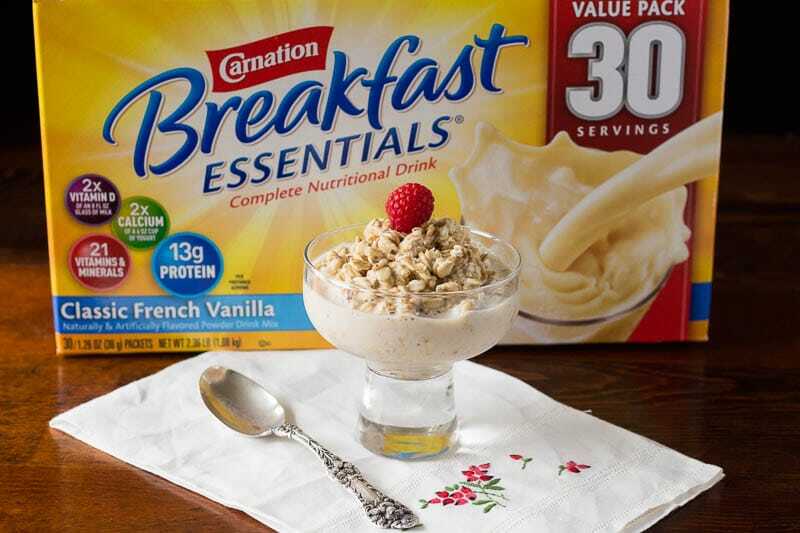 Using Carnation Breakfast Essentials® in this recipe makes breakfast incredibly easy and delicious! Many times, we’re in such a hurry in the morning that it’s hard to come up with a breakfast plan that works for the whole family. 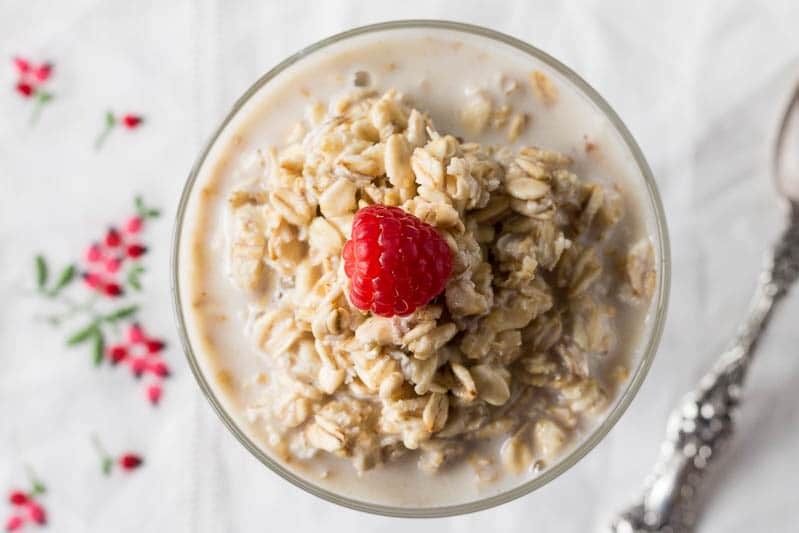 This easy overnight oats recipe with Carnation Breakfast Essentials® solves that problem by making it a snap to put breakfast on the table for the whole family. It easily scales up or down, depending on how many people you need to feed, and it has only three ingredients! Plus, the extra time you save by using Carnation Breakfast Essentials® will let you slow down and enjoy the first meal of the day rather than rush through it. You can get more ideas to make your family breakfast fast and tasty by joining the Carnation 7-Day Breakfast Challenge. In addition to eating a nutritious breakfast each day for seven days straight, you can also complete simple breakfast missions though the end of February for a chance to win prizes! 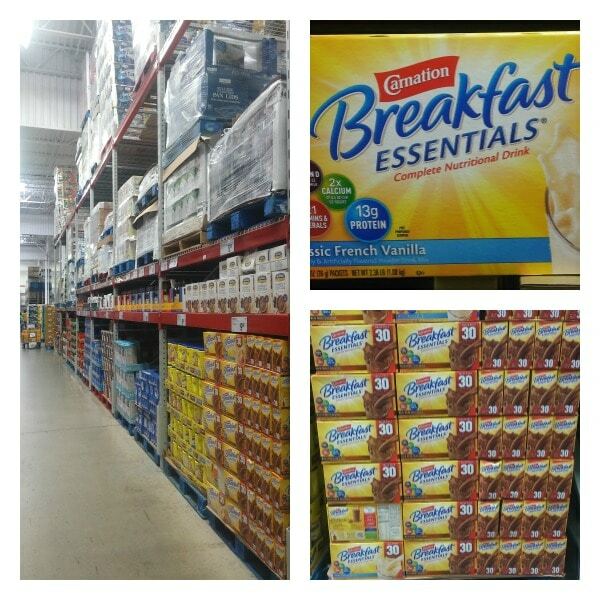 I picked up my 30 pack of Carnation Breakfast Essentials® Classic French Vanilla at Sam’s Club. You can find it on one of the breakfast aisles. Complete a simple yet fun breakfast mission for a chance to win. New prizes will be revealed every day! Come back any day in February to complete missions and see new prizes. 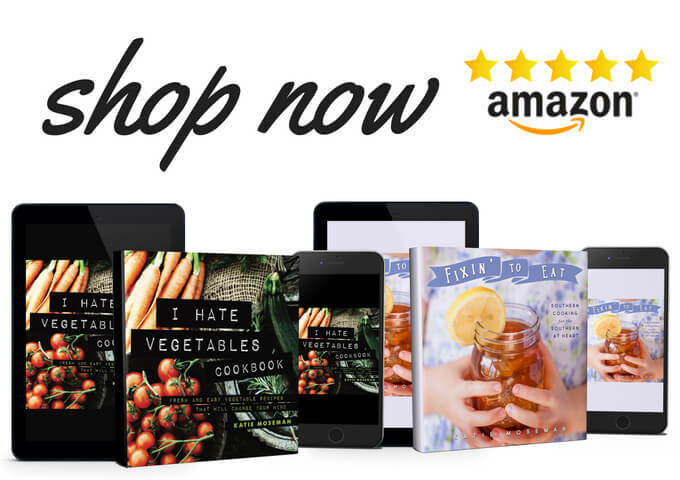 The prizes range from a Fitbit to a GoPro and other awesome stuff! Head to your favorite store to purchase a Carnation Breakfast Essentials® Nutritional Product and upload your receipt for five extra entries per day. Did you know you can also use old-fashioned oats to make these vanishing cookies? Place the Carnation Breakfast Essentials Vanilla powder in a bowl. Add the milk and stir until smooth. Add the oats and stir to combine. Cover and let sit in the refrigerator overnight. In the morning, stir and enjoy. This recipe serves two. Double to serve four, triple to serve six, and so on. Follow Carnation Breakfast Essentials on Facebook! The longer I live abroad, the more intrigued I become by American food. In Denmark, there is very little prepared food, and fortified food is illegal, so I make pretty much everything from scratch using basic ingredients. Oh how I long for the convenience of the shortcuts I took for granted back in the States. At least this is mostly from scratch, with the milk and oatmeal. The powder adds the sweetness and some extra nutrients, which is good, too. These easy overnight oats do look like the ultimate breakfast idea for working Moms and Dads. I have never thought to add Carnation Breakfast to them! I make them all the time with almond milk and fruit but adding the Carnation especially for my son is brilliant! Thanks for sharing this great hack! I have never thought about overnight oats until recently. It seems like it is everyone’s new favorite breakfast. Adding the carnation into it is also a great idea for the added nutrients. Overnight oats has been such a “thing” that I can’t believe I didn’t try it for so long! Looks really, really good. I like the idea of breakfast being ready and in the fridge when I wake up. Oatmeal is so good for you too! I will try this soon. Yup, just roll out of bed, and there it is, waiting for you. That’s my idea of simple! That’s a very nice breakfast to start your day with. I would love to try this recipe one of these days. Thanks so much for sharing. It really is. It’s so easy, too! I like a good oatmeal — more so if it’s prepared overnight! That way the flavors really come to ‘stick’. Thanks for this recipe! Overnight really does make the flavors mesh well. Thanks for stopping by! This looks really good! 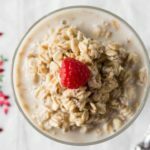 I have been having a hard time with my breakfast routine and this will definitely help get me out of the rut. For sure! I’m actually experimenting with using steel cut oats, too. It soaks up more milk, but I just add a little extra plain milk in the morning. Is this eaten cold, right out of the fridge? Wow this looks healthy and yummy at the same time! I am on a health kick and looking for breakfast options that are creative yet healthy so I will def have to try this! Hope you like it! It sure makes breakfast easy. 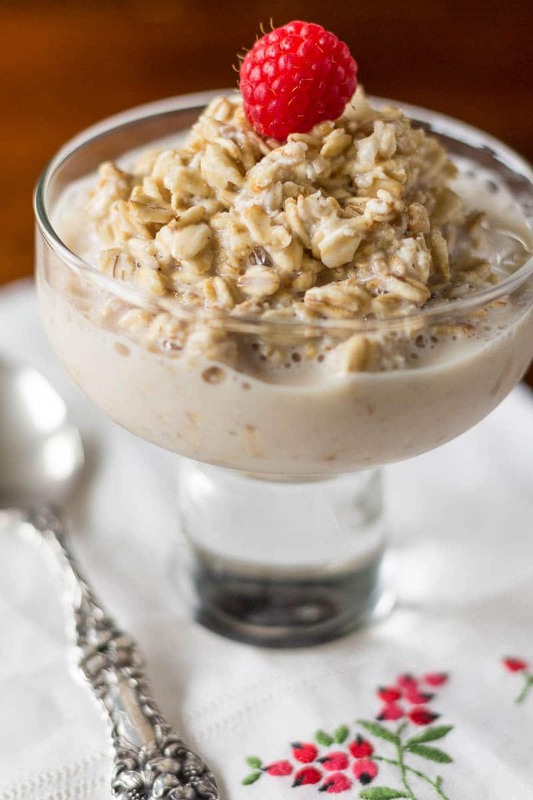 Good breakfast with healthy oats with the combination of vanilla.